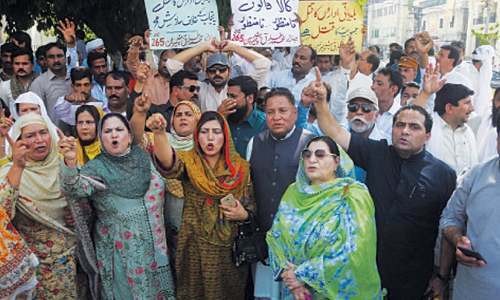 LAHORE: The proposed plan to shift head office of the National Transmission and Despatch Company (NTDC) to a private plaza in DHA from the Wapda House has drawn severe criticism from its employees who have termed the move wastage of massive financial resources. “We have decided to resist this move as it’s wastage of huge public money. Why are they shifting the head office of the NTDC — the country’s premier organisation looking after the affairs of national power transmission and despatch system—from Wapda House to a private premises in the DHA on rent worth millions per month?” questioned Muhammad Nawaz Chughtai, secretary general of Paigham Union (NTDC chapter). “Here (in Wapda House), we are paying Rs75 per sq foot (monthly rent) with all facilities—security, generators etc. But the place our officers plan to shift to will cost us heavily as we have to pay Rs135 per sq foot rent alone. So why the NTDC higher-ups are doing so despite the fact they and their staff are comfortable at Wapda House?” he expressed his surprise while talking to Dawn. According to an advertisement published in the print media in July, the NTDC intended to get a building having 125,000 to 170,000 sq ft space in a commercial area. Besides, the company sought a parking space for 200 vehicles and other urban facilities. The company further sought that the bidders must submit their sealed bids by Aug 3, 2018. On the other hand, an official document revealed that the NTDC continued paying Rs75 per sq ft as monthly rent to the Wapda House management since 2012. Before this, the company and others were paying Rs35 per sq ft.
“The Wapda House is situated at the prime location of Charing Cross. It is a beautiful and well-constructed building in the provincial capital at a strategically important point. It has several offices of Wapda, NTDC, state-owned power generation companies, PITC etc. Why are they insisting on shifting?” questioned Abdul Shakoor, another office-bearer of the union. He said if the senior officials succeeded in getting the NTDC offices shifted to a private place, the management would have to spend millions on setting up of new offices (cabins etc), purchase of equipments, generators, transportation / pick & drop of the employees and other matters. “We appeal to Prime Minister Imran Khan and the chief justice of Pakistan to take notice of the situation and stop those planning to waste millions of rupees from the public exchequer,” he demanded. According to Mr Chughtai, the plaza where the NTDC office, according to the proposed plan, was being shifted was actually owned by a close relative of an NTDC officer. “For the last eight years, this plaza couldn’t be rented out. And now our officers want to get this on rent for the NTDC head office,” he alleged. Talking to Dawn, a spokesman for the NTDC rejected the allegations, stating that the union members were distorting the facts. “The plan (to shift the head office) is not final yet,” he said and added that at present, the NTDC offices were scattered, some are in Wapda House and some at various premises in Johar Town, Gulberg and Model Town. “So it was planned to bring all the offices of the NTDC together at one place,” he claimed. Stop this wasteful exercise. If need be, the Power Ministry can lower the current rent NTDC gives to WAPDA house.